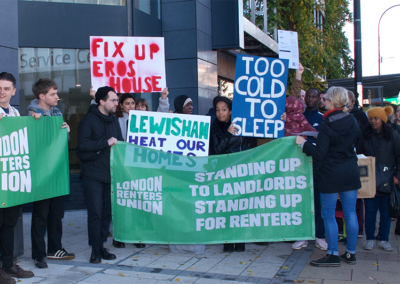 On Tuesday a group of 40 Eros House residents and other members of the London Renters Union protested outside Lewisham Council and delivered a letter addressed to Mayor Damian Eagon. Our letter demanded immediate action to fix the broken heating systems, solve issues with damp in the flats and other urgent safety repairs. Eros House is privately owned by Quinata Global. 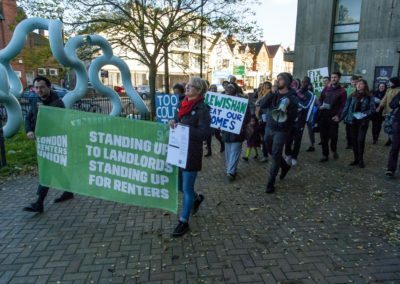 Lewisham council has leased 45 flats in the block which are managed by District Homes and used as temporary accommodation, and other councils have leased a small number of flats. Several other flats are privately rented from the landlord. Lewisham council has two sets of responsibilities in relation to the flat. 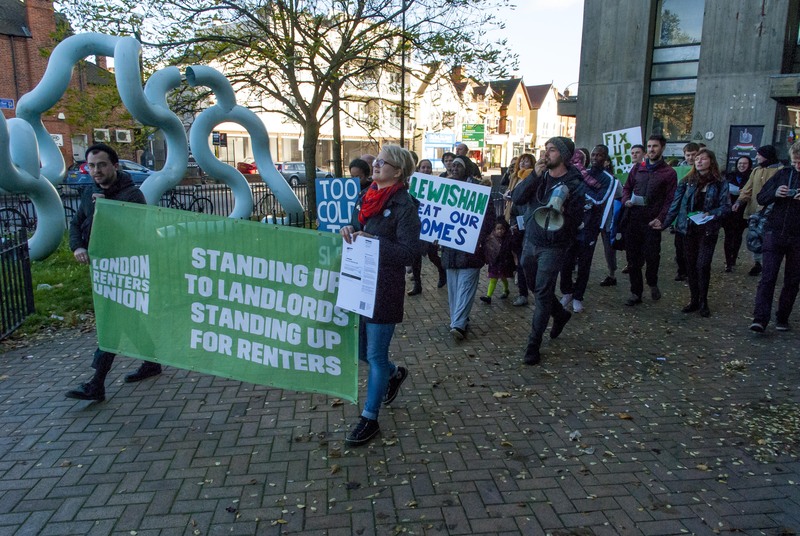 Firstly, Lewisham Council has placed many families in the block in temporary accommodation so has a legal duty to ensure that accommodation is suitable and meets certain standards regarding health and safety. Secondly, Lewisham council has legal obligations to enforce standards in all privately rented accommodation in the borough. 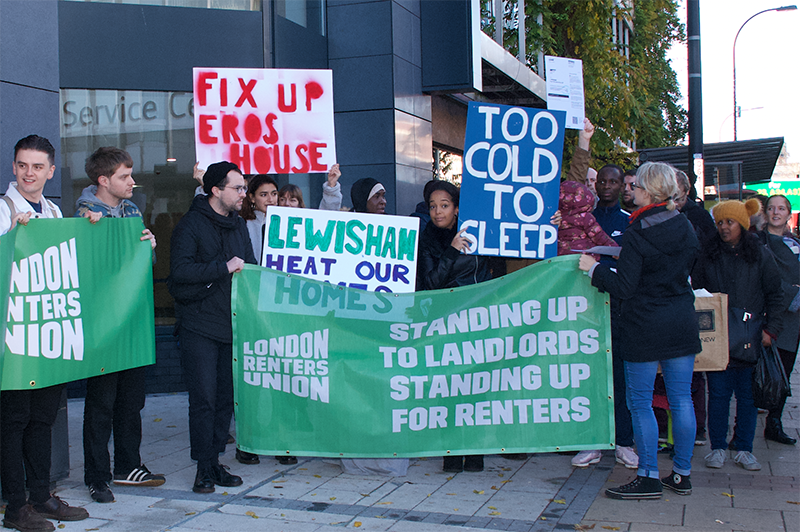 We welcome Lewisham Council’s statement regarding Eros House because it acknowledges that it has a role to play in pressuring District Homes and Quinata Global to improve conditions. However, there are several important problems with the council’s statement. We hope to be able to discuss with them soon in a meeting with senior council officials and politicians but we also think it is important to place them on the public record. The council appears to be stating that damp in Eros House is limited to communal areas. This couldn’t be further from the truth. 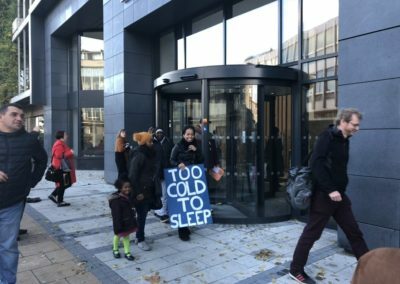 Many residents at the protest yesterday and other LRU members living in the block live with chronic mould inside their flats. This mould is causing serious health issues for residents including several young children. It is good news that repairs will be made to the roof. However, the damp and mould is also being caused by ongoing leaks and a lack of proper insulation in the flats. These issues must be addressed to alleviate the chronic damp and mould in the flats. Dehumidifiers must be installed in the meantime. 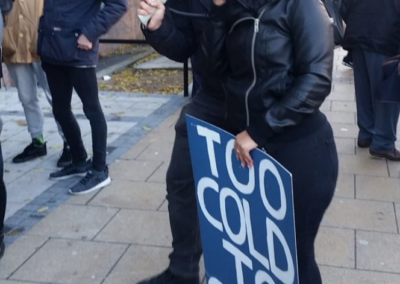 While the commitment that entirely broken heaters will be replaced is welcome, is very disappointing that the council is not insisting that District Homes and Quinata provide safe, decent, efficient heating in each flat ahead of the coldest winter months, especially given that this would cost relatively little compared to the huge sums collected in rent each month by District Homes and Quinata. Many of the heaters in the flats dangerously overheat the surrounding walls. In our June meeting with the council and District Homes, we asked to see records of safety tests that prove this overheating does not provide a fire risk. These records have never been produced. Heaters in many flats do not produce enough heat to warm the flats. In many other flats, the heaters are faulty and highly inefficient, making them extremely expensive to run during the winter. 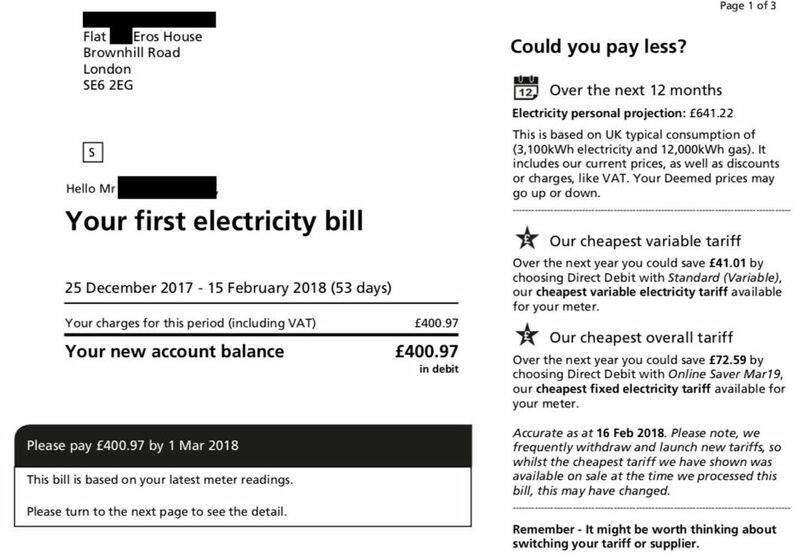 One resident received a bill for £400 for the period December 25 2017 – February 15 2018. 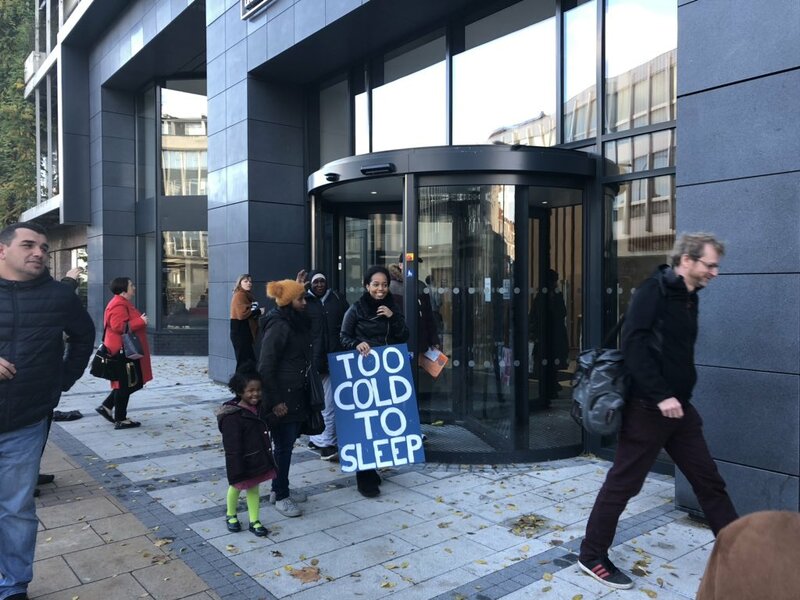 Unless urgent action is taken to install adequate heating in all flats, many residents will spend the winter very cold or having to make agonising choices between heating their homes and paying other essential bills. We are concerned that the council statement refers to “giving advice to residents about how they can reduce the risk of condensation”. The chronic mould in the flats is caused by the structural issues and the mismanagement of the building, not by the behaviour of individual residents. The council is the customer of District Homes and is paying District Homes to manage the flats. It is unclear why it is not insisting that the urgent health and safety issues are resolved in the 45 flats that it is leasing. Given that the council has the responsibility for upholding health and safety in the privately rented flats, it is unclear why the council is not issuing improvement notices for the privately rented flats. We hope the council will start using its powers properly to prevent what appears to be a managed decline of the building by the landlord, who is perhaps hoping to cash in on future redevelopment of Catford. 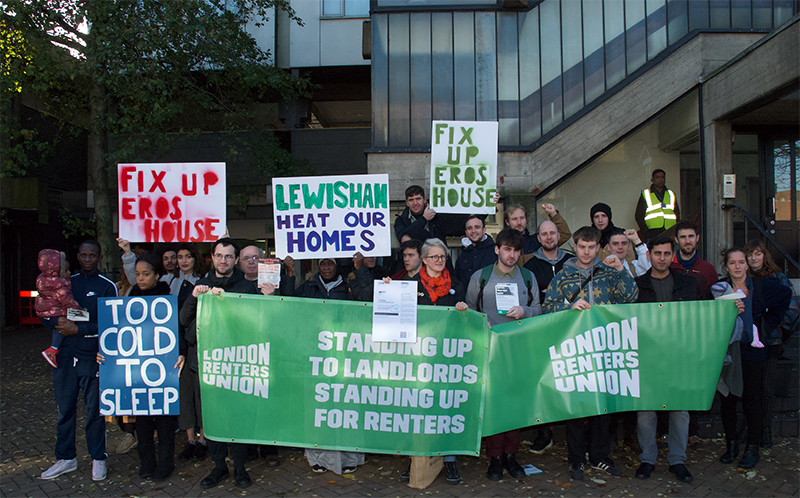 The Lewisham branch of the London Renters Union has been established by private renters in the borough as a means by which renters can organise and advance their interests. 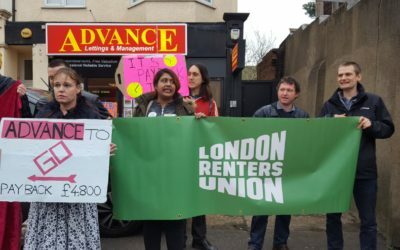 This is concerning to the Lewisham branch of the London Renters Union for three reasons. 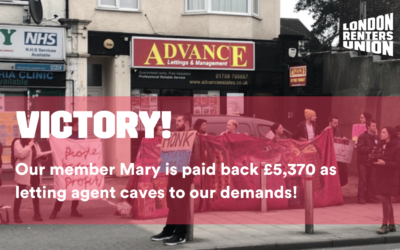 First, as a major landlord in the borough and as the body responsible for upholding standards, there would be a clear conflict of interest involved in the council establishing a renters union that would only be able to function properly by applying pressure on the council where necessary. 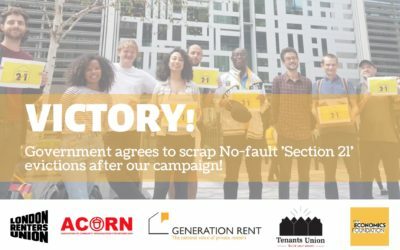 Secondly, given its reluctance to use its existing powers with regards to Eros House, we lack confidence that any union established by the council would be sufficiently bold in supporting the interests of renters. Any resources the council has already earmarked for the establishment of a new union would be better spent ensuring its enforcement duties are properly resourced. 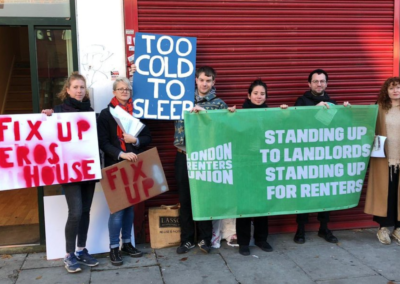 Thirdly, we are concerned that an announcement regarding the plans for a new ‘Private Renters Union’ appears to be a means by which the council hopes to deflect or undermine the criticisms we are raising and undermine our organising at a time at which we are placing the council’s actions under scrutiny. 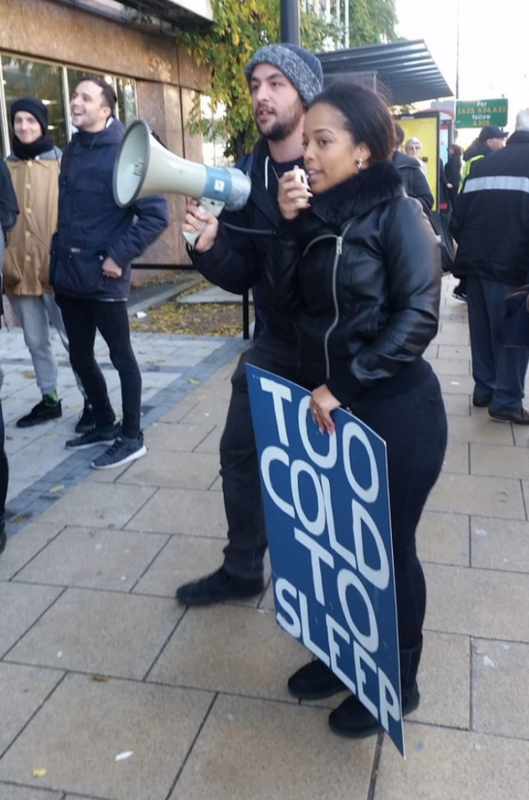 Similarly, we hope that council staff showing up at Eros House on Tuesday as residents were gathering to march over to the council offices was not an attempt to prevent the protest from taking place at the council buildings. We have a great deal of respect for the hard work done by many council staff. 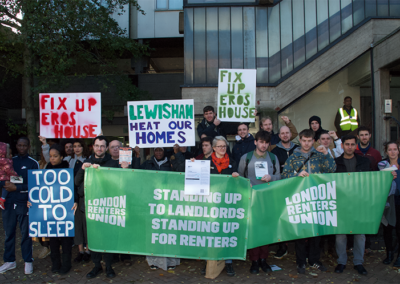 We hope to meet with council officers and local politicians soon to examine what further steps we can take together to improve the situation at Eros House and address the borough’s housing crisis as a whole, including what the council can do to distribute information about the Lewisham branch of the London Renters Union to renters in the borough.